Co-Owner “ Our commitment is to advise, direct, advocate, or otherwise help our clients through the full spectrum of life's challenges as we are all affected by our laws and the legal system. Bruno has practiced law since 1974. He was the managing partner in the largest law firm in Southeast Wisconsin, with as many as 13 attorneys. In 1986, he started his own practice. Rizzo & Diersen has grown into a current full-service law firm with a large team of attorneys, offering a broad range of legal services. He specializes in accounting, finance, taxation, estate planning and elder law issues. 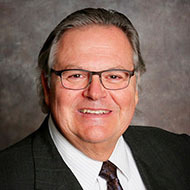 He has extensive experience in both residential and commercial real estate transactions, probate, business law, all taxation matters – both state and federal, and specialty elder law issues. He will customize a plan that will fit your needs. Bruno Rizzo is married to a former school teacher who taught ESL. They have 3 children. One is an attorney and another is the office manager in the law firm. The third child relocated to a warmer climate. In 1996, Mr. Rizzo ran a strong campaign for State Senate, finishing with the best showing ever for a Republican in Kenosha County, Wisconsin. He also served for two years in the U.S. Army after being drafted during law school.